Note: Steam gifts are for collectors, and often valued higher than their store price. They're best used for showing off your favorite games in your inventory. This list was imported from my tradables at Lestrade's on November 26, 2018. Follow the link if you want to change the sort order or compare with your own lists. This list was imported from my wishlist at Lestrade's on January 14, 2019. Follow the link if you want to change the sort order or compare with your own lists. Please read my wishlist above before you start simply posting a link to your trade page. This might save us all some time. I MUCH prefer trading games for games. I haven't had time to play games in quite a while. Trading isn't currently a priority for me. I will refuse any blatantly unbalanced offer for my valuable games, don't even bother. I trade mostly based on G2A value, for popular games, or Lestrade's or BVG ratios, for less popular ones that weren't bundled recently. If a game isn't in my wishlist above (or on Steam), DO NOT bother to offer it. I also accept keys and ToD's. Make offers if a price isn't specified. I give priority to trades done through Lestrade's. It has my most up-to-date wishlist & tradables. Noir Syndrome, Loot Hero DX, Bejeweled 3 for PAC-MAN™ Championship Edition DX+ All You Can Eat Edition Bundle + LOST PLANET® 3 hb gift link? I also have many other games of the same genre. Ok, thanks. So are you willing to trade? What about the other three games I listed? I'm sorry. I don't understand the purpose of this thread. You have Clockwork Tales: Of Glass and Ink in your "I want" list. I made an offer giving you the option to choose which game you would to trade for, and you rejected behind a wall of texts and talk, even redirecting to IndieGala, a platform independent from SteamGifts. Funny thing is that this is the same thing you have been doing with all the people that have been posting here offering trades. All talk and no action. No wonder why you have been not even traded the first time and this one looks more like a discussion thread than a trade thread. You must be definitely new here. Go to www.barter.vg that's more like a straightforward trading, no talk. If I added Clockwork Tales? Ah, I don't have anything else I think, so it's fine. Thanks for your time. Well the most i can offer is 3 among Journey of a roach, 7th guest, quantum conscience and clockwork for Fez. I'm also interested in Undertale. So we could do Long Live the Queen, Gunpoint, Journey of a roach, 7th guest, quantum conscience and clockwork for Fez and Undertale. You have yet to reply to my Steam invite. Did you see it? Reminder: you're offering to trade Roach+Quantum Conscience+Clockwork Tales in exchange for FEZ. Oh, I wouldve been good with that offer, but since you got Quantum Conscience, guess it's too late. Well anyways, nah, don't want to trade those three for Fez. I'd be good if you pick 2 of them. Issue with that is I realized i don't have ancient space anymore, else I would've offered it too. I could look for a copy for you if you'd like though. OH EUROS I see... I was looking at USD... well anyways, no deal. And here's where I introduce you to another website for checking prices, steamdb.info. Hello. I have a few keys I'm vaguely interested in (Speedball 2 HD, Darwinia, Multiwinia), but mostly for nostalgia reasons... What can we do from here? Yes, I was thinking that (Contagion + Never Ending Night in exchange for Speedball + Darwinia + Multiwinia). How do we proceed from here? As has been painfully pointed out earlier today, I'm really new to this website. What do you think only Speedball 2 HD for Never Ending Night ? Anything else from my list you'd like..? Hi. I'm having a hard time finding games that I want from your list... Maybe The 7th Guest... Maybe Driftmoon, although I played it long ago and didn't like it much. I don't know. Two for one? I'm afraid so... And even then, if you say no I'll probably be relieved, lol. Feel free to offer anything else in the future, if Portal is still available or you haven't found it elsewhere! Hi. I'm interested in The Princess' Heart, Chainsaw Warrior, Chainsaw Warrior: Lords of the Night, Don'Yoku, Tristoy. Something here for them ? Yes, and Lucius is secondary to me too... As I said: that's the best I can do. Tristoy is a duplicate key of mine so I won't miss it; the other keys I haven't redeemed and only own a single key of them, so if you also have a duplicate of Lucius we'd be trading duplicates and that's all right. I could also trade for Cubetractor+Lucius, but only for Don'Yaku+Tristoy I'm afraid... Please don't hit me ;) It's not the end of the world. I'm off to bed, let's sleep on it. OK. Cubetractor+Lucius for Don'Yaku+Tristoy. Added. Hare In The Hat for Tristoy or Joe's Diner? Hi! Sorry, got these all already, except for Resident Evil 4 that I have no interest in, and DmC which I'd like to have, but I'd trade a 'normal' key for it, not a full-price game. Anything else you'd like in my list..? Nothing else for me in the list but thanks for the detailed answer! Maybe a combination of Rex Nebular, Gunspell & Viscera Santa? These are all cheap games with no trading cards and mixed reviews AFAIK, so they're not worth much on the trade market. Edit: just found out that Gunspell is in the latest DIG bundle. I'm thinking of buying the bundle for another game as well, I'll wait for your feedback then. It's a deal, feel free to add me. Sorry, couldn't find anything... :( Only thing I'd like is the Darwinia soundtrack, but it's not enough for that key... :-/ any minor keys you'd like from my list? Which games do you consider to be minor? Oh... Err, I don't know, about half of my list..? I can't list them all ;) Usually cheap platformers if you're into that. Bundle leftovers with no TCs, bad games with TCs. Should I separate my list into 'good' and 'cheap' keys..? Does Slinki meet requirement for a cheap platformer? ^^ If not I could take The Logomancer or Pretentious Game or something esle too. However, I am mostly after Sliniki if that would be possible. I don't have Darwinia (yet?! ), so I couldn't even register it. Slinki isn't a bad game, it's just 60% or so, and with TCs it's borderline 'good deal'. If you had the Darwinia game as well as its soundtrack, I'd trade it for Slinki + Pretentious Game in a second of course. Hi. Insurgency for something from my list maybe ? Interested in anything here by any chance? Sorry, no, I already have anything I'd have wanted. Given your rep score, I'll assume that I came here after the end of the battle, right..? I trade mostly for fun and to get rid of repeats so no problem. Hi! Will you trade your Meltdown for my Hamlet? Meh... Hard one. I actually finished Hamlet some time ago and it's just the completist in me that wants it in my library. Anything to tip off the balance..? Lol. Seriously, don't you have other keys to trade for...? No, I've just graduated from school so try to only buy games I will keep. You really would make me very happy if you would accept this trade. Pretty please? Free keys everywhere... Nope, nothing for me. I only trade for games. Hi would you do Hamlet for Unhack and Time Gentlemen Pleas! ? Yes, for either of these. Is it possible that you could get Unhack:Destruction? If so I would do Unhack+DLC for Hamlet. If I had DLC I would have said it. Maybe the key has it but I doubt it. Could we do Hamlet for Unhack+random game? Random..? Why random? You mean I choose an extra key to give you? Cut that Idea away. I'll do Hamlet for Unhack. I'll add you. Anything here for Citizens of Earth? Any of this games for Teslagrad, A Story About My Uncle? Sid Meier's Civilization IV for Citizens of Earth? I'll keep that one in mind, but in the meantime I remembered that I already have Civilization V (not complete, but whatever), and haven't had time to play it at all. Lol. Hi again, anything reasonable here for Citizens of Earth? I'm only interested in Coffin Dodgers but it's more of a minor key to me. I suppose you don't have anything else? Sorry, I missed your post. I suppose you've acquired Citizens of Earth in the meantime? Or is it still worth looking into your list? I already own CItizens of Earth but I would be interested in Salt, Towerfall Ascension and Zone 22.
http://www.steamtrades.com/trade/2cptb/h-bundle-leftovers-w-games-i-dont-own-dota-2team-fortress-2-items Anything for Citizens of Earth? Hi, something from my list for Citizens of Earth? Clockwork Tales, Coffin Dodgers, Sid Meier's Pirates! Gold Plus, maybe Luxuria Superbia... Nope, these are all minor keys to me (except maybe Pirates! ), maybe if they're all grouped together and I have no better offer... But even then I'll probably just cling to my key for now. http://www.steamtrades.com/trade/rLVAI/h-lumber-islandgo-to-bedabys-odysseysilent-stormdeadly-prem-etcwcardsgames/search?page=15 anything for citizens of earth? Sorry, nope. Only interested (a bit) in Noir Syndrome, and will only trade a minor key (or a couple, depending on which) for that one. Squishy the Suicidal Pig and Tiny Bridge Ratventure for Fez? Sorry, nothing for me there. Something for Citizens of earth? Anything from here for Lost Planet 3? Nothing else of interest to me. I even traded Kavkaz for a bad game because I was desperate to get rid of it, I don't like games that so blatantly rip off someone else's work. I'd like to trade for all 3 or none if possible, since they're all form the same bundle. I'm looking for the Drakensang DLC (not the game itself), do you have it? I'm also a taker for Mahjongg Investigations (low priority). They're both in the same bundle as well, and it looks like you bought it. I'm waiting until later today before its price increases. I got the DLC for myself, sorry. Anyway, feel free to write back any time if you want to trade. what do u want for euro truck simulator 2? Well, there's my wishlist above... Also check out my Steam wishlist for a ranked list. The higher in the list, the more likely I'm to trade. Lol, among the list I was interested in Dinner Date, and I was surprised to find out I already have it... Anyway. Would also like to trade other games for 2 cheap (both bundled & $0.5 Steam sales) adventure keys: Alum and 'I have no mouth and I must scream'. Look through my list, if you find anything else you're interested in. Already got Citizens of Earth. thanks though, checking your thread for others. Heileen 3 were from bundles. I don't do reviews, nor will I be a scumbag to sell off any review keys if I was one. AFAIK Heileen 3 was never bundled, that's why I'm asking. I only want it as a completionist (already have 1 & 2, haven't even played them lol), it'll probably be rebundled next year though. Anyway, still interested in Heileen 3 (will give a normal key), Borderlands 2 GOTY (good key), Alum (cheap key) and IHNMBIMS (cheap key). Oh, and Tropica 4, but same problem, haven't played the 3rd yet lol. Anything in my list you'd want? Thanks, but I already own everything else there, other than Undertale, but that's definitely not gonna happen haha. 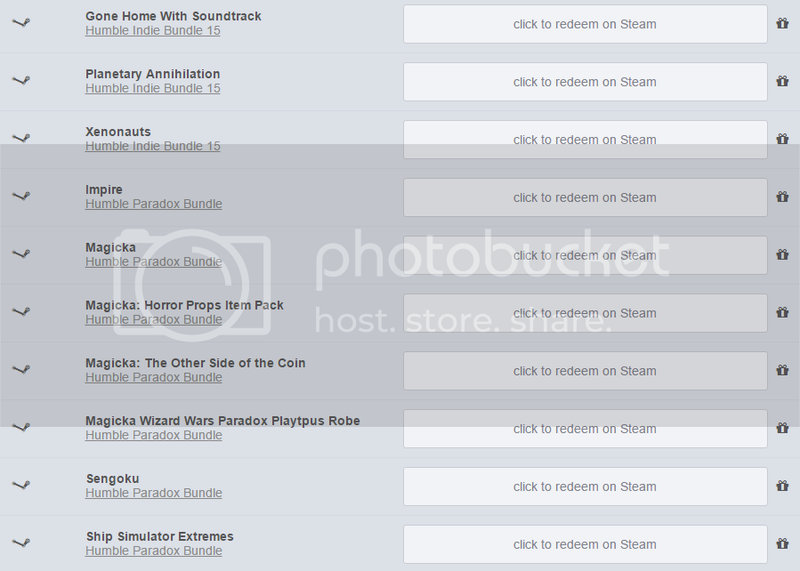 I could use either of these steam gifts for a Playblink giveaway, but again, not a fair trade for you either. I would consider Undertale for Borderlands GOTY + Heileen 3 + Alum + IHNM + Tropico 4. But it would still pain me, lol. Portal and Hack'n'Slash for 'real' games... Don't have to be great offers. Yes/no? Your pricing system is seriously out of whack, let me tell you. Undertale at FULL PRICE is literally only 10 bucks for me. 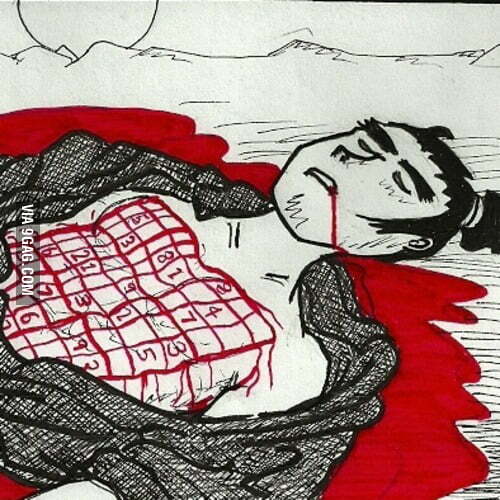 I gotta be committing sudoku just to give you all of that for it. Anyway, It is called "seppuku." Look at Mr Smartypants arab with his education here. Anyway, did they actually made a meme because of people with broken English like yourself? HAHA. It's great that you're still committed to sûdoku after it's been out of fashion for so many years. Keep it up. As for game prices -- I'm not supposed to know how you got hold of the keys. If you got Borderlands 2 GOTY for free, then it's a great opportunity. You could even negotiate... Like, I was implying I could give you Portal and Hack'n'Slash in addition to Undertale. But, whatever. I'll just redeem Undertale for myself. Good day. So, what would you want for just Heileen 3? @Speakertag What a pathetic loser you are still. Leave people alone you damn massive douche. Being confined to your room and rejected by everyone around you in real life, does not give you the right to talk in this way to people on the internet. I thought you suicide bombed yourself already? It is never too late to go out of your room. You can do it! It's never too late to convert out of terrorism. Just turn yourself into the police. A middle aged man arguing with a 'kid' though, that's pathetic and will never be cleaned from your slate. If you are a kid, it is even worse. Your parents shouldn't let you use Steam, or trade with adults. Do Muslims in your schools bully you all the time? Be better than them and stop hating on the whole world. Sorry about the irrelevant comments. At least you got few free bumps. I'm the owner of this thread, I didn't request a conversation about terrorism (?)... Don't want free bumps, lol. (your) Undertale for (my) The Talos Principle? That's an interesting offer and I'm considering it, but Talos is worth $6.5 on g2a (Undertale is still $10), and likely to be bundled more quickly because it was released a year ago (and I'm a Humble Monthly subscriber). Anything else to throw in addition to it..? To tell you the truth, I'm trying to get Undertale with the three Falchion keys I have on hand (haven't bought Talos for this purpose yet). Looking through your wishlist: I can do Grand Theft Auto IV, or Metro Redux Bundle instead. Otherwise, the sweets I could add to Talos would be less than 1 key (I can get Undertale for 4 keys). I've never played online multiplayer games... What's the obsession with in-game keys for these on steamgifts.com...? It's confusing because outside of here, what we call 'keys' are 'Steam keys'... Are they like a stable currency or something? How much is it worth anyway? Do you even have to have these games to use that 'currency'? Why not just trading cards or Paypal? Yes, and they're very stable by trade prices (not Steam market). TF2 keys are 1.75 USD; CSGO keys (different types) are 1.85-1.95 USD. Owning the game (TF2/CSGO) is not necessary. To buy something like MGSV with trading cards would require over 1000 of them. Paypal is often risky, and doesn't work with automated vendors (bots), while keys do. Most game sellers don't take paypal because it requires more work. Thoughts on GTA IV, or Metro Redux Bundle? Nope, not interested, unless for other keys. Alright, figures. As you said, Undertale is not easy to get cheaply. Well, $10 is not that expensive, I did fork them out. Then again most people here collect games without playing them. $10 is expensive for a random library entry. Yeah I just mean it's not much cheaper by trade than in-store, unlike almost all games here, which are at least -50% by trade. I could offer you Clockwork Tales: Of Glass and Ink for Abyss Odyssey. Let me know. Hmm. I already have two pending trades with Clockwork, and I don't see this game as more than a 'cherry on top'. Anything else to tip the balance™..? Not really. I'll pass then. Ah, well... Could you wait for a few days for it, just to see if the deals fall apart or not..? They tend to, from my short experience lol. Then I'll do the trade. Any of these for undertale? I can trade a few keys for it. Looks like you already traded the games I was into. I'm interested in The Architect and Undertale. I know the latter is particularly valuable since the game is hot, but I might as well ask, eh? Edit: I just noticed you have Ludoku in your wishlist, which I have, just in case you missed it. How about one of these for The Architect? Hey there. Yes, it's refreshiing eh eh. I guess I shouldn't be posting bigger keys and expecting to get offers for smaller games. Anyway! Amerzone + Shadow on the Vatican + Avencast? Hi there! 1 game for it would be a fair offer, but as you plan to redeem it, I will do a really good offer which is shadow of the vatican + avencast (2:1). Also, they're not rare keys either. Got plenty of offers with these so far. So you know that 3:1 is really rare, and 2:1 uncommon. I can do 2:1. Something here for Citizens of Earth? Hi! Something here for Rituals? Anyway, if you really want to trade for it, I noted these cheap keys: Voyage, Nostramadus, Shadows on the Vatican and Quantum Rush Champions. The last 2-3 look like they might be okay for me. What do you think? Thanks for your answer. I already own Rituals. Happy trading! Thanks. Anything you'd trade for those keys, though..? How about your Neverending Nightmares and Citizens of Earth? Hmm, could trade the last 3 for the HB gift link to Neverending Nightmares (which has trading cards). Up for it? Okay, then just the last 2? An erroe occurred when I add you a friend on steam. Can you add me on steam? Hi! Anything from my list for Citizens of Earth ? Already got Citizens of Earth from another trade, but thanks for the response. How many cards for these games? The whole lot..? You'll have to remove Glorkian Warrior because I moved it outside of my last category (which I have a feeling you looked at and kept the games you didn't already have, lol). Well, I suppose it depends on the value of cards and/or what games they're for, doesn't it..? If I don't have a say in what games, that's mostly to resell them then... Would only be interesting for a benefit of, hmm... 7€ for the lot, which is already cheap for 20 games... So... Including Steam and dev taxes... 9€... / 0.07 = 128 cards. Oh, and it's a power of 2, too! I like that number. Anyway, as long as the number of cards totals 9€. I don't know about the prices in dollars but they're usually the same. You could pick which games, it doesn't really matter. Also, would foils be acceptable? Well, foils are sometimes hard to resell... I've got quite a few around, lol. I'll accept tf2 keys or whatever, if you prefer that. It seems to be the de facto currency on steamgifts.com, and another trader kindly explained to me what I needed to know about them on Steam chat. Well, what can I say, I'm new here. Hi, anything(s) interest you from my list for your Citizens of Earth, Paperbound, and/or Chargeshot? Can also offer plenty of cards. Feel free to write anything(s) that might interest you here, even if it's several things. I prefer to know potential trades before adding. Thanks! Apologies for the delay, was busy doing some tough parenting, ah ah, good times. First of all, as indicated I'm not planning to trade Undertale for now, sorry about that. I'm only gauging interest before I decide whether to redeem it for myself (I'm trying to 100% Witcher 3 so I don't have much time to play other games for now.) Someone offered me a key of Evoland 2 for it (it's worth twice the price of Undertale), but I declined even that. All the other keys you listed are available for you. What do you think? I have more keys I'm interested in, we can discuss them on chat later. Sure, I would all pretty much be up for trade for some things. I will have to let you know more later, since I will be out diving all day now, but I think I can trade all of them later today, if you're still interested. Sure. I think you went to bed right before I wrote back to you though, lol. I edited the list down to three games that I'd want. I could offer up any 3 games that you'd wanted from me--assuming I still have them (sometimes I overlook some that shouldn't be on my list anymore)--but we can chat on Steam. Gotta get my kid to the doctor first. Sorry, already have most of these!